San Pedro de Atacama lies in Northern Chile in the Atacama Desert, one of the driest regions on Earth, but if you imagine a lonely place surrounded by nothing but sand, you might be disappointed, or at least surprised. San Pedro de Atacama is a lively small town living out of tourism. It was so far the most touristy town in South America we have visited (even Cusco did not feel this way, but maybe only because it is much bigger and people have a chance to disperse). It is sometimes not a bad thing when you arrive in a touristy place as there's a welcoming infrastructure such as public transport, accommodation, grocery stores or restaurants; and very often the competition drives the prices down. But not in San Pedro de Atacama - yes, there are plenty of hotels, cafes, restaurants, and tour operators, but everything is utterly overpriced (for no obvious reason as the place is not that cut off and the standards are not higher). And we are not talking yet about the lack of grocery shops and two ATMs which run out of money often - it is probably unexpected that all tourists who had just crossed borders from Bolivia need to withdraw money. Although the authentic appeal of the town is gone, the landscape around San Pedro de Atacama is absolutely stunning - cone-shaped volcanoes, colorful lagoons, geysers, colonies of flamingos, clear skies perfect for stargazing or other-worldly rugged valleys, that's in short what you can expect when visiting Atacama desert. The good news is that you can still enjoy the beauty of this place even when you travel on a budget and in this guide, we will show you how. Right after we arrived in San Pedro de Atacama, we knew that our original plan to stay four nights wouldn't be possible because the accommodation in the town was simply too expensive. Also, although we have planned to join some tours, we pretty soon found out that we had seen a very similar landscape - volcanoes, lagoons, and geysers - on our 3-days Salar de Uyuni tour and did not feel like spending more money. Travel tip | The highlight of all Bolivia's travels, Salar de Uyuni is right across the borders. Many travelers arrive in Chile from Bolivia, taking the tour from Uyuni and we recommend you do the same. You can also visit Salt Flats from San Pedro de Atacama, but taking a trip from Chile is more costly. Not only you will enjoy the world's largest salt flat, but also an unusual scenery along the borders between Bolivia and Chile and you won't have to spend money for similar activities in San Pedro de Atacama unless of course, you want to. Read more about our three-day Salar de Uyuni Tour. When traveling on a budget, do not despair as there are still a few things you can do in San Pedro de Atacama which are amazing and won't ruin your bank account. Volcano Licancabur, almost 6000 meters high is a dominant of San Pedro de Atacama which you can't overlook. This symmetrically shaped volcano lies right on the borders between Chile and Bolivia, and you can enjoy a free spectacular view of the volcano from every corner of the town. For travelers with more dollars in their pocket, there's an option to arrange a climbing tour to the top of Licancabur Volcano as well. Atacama desert is a place with almost the best conditions for stargazing. Why? The relatively high altitude, dry conditions and lack of air pollutions create a perfect environment. Although there are many tour operators in San Pedro de Atacama offering stargazing trip with telescopes, if you want to save some money, you still can enjoy the night sky by yourself in a more adventurous way. It is very easy, the only thing you need to do is to head somewhere near the town where it is pitch dark - Valle de la Luna would be a great spot. It is more convenient to go by car, but if you don't mind a bit of exercise, rent a bike: it is a short ride to get out of the town, only do not forget to take headlamp (the rental company should provide you with bike torch and reflective vest for your safety). Travel tip | You should plan the stargazing activity at least 6 days before and after the full moon, you will see more stars. The best budget way how to enjoy the moon-like surroundings of San Pedro de Atacama is on foot or by bike. You will need at least one day to fully appreciate the vastness of this unique landscape, and in case you have more time than a day, you can visit Valle de la Muerte as well. The entrance fee to Valle de la Luna is 2500 CLP when you enter before 12 PM or 3000 CLP when you enter the reserve in the afternoon. Although the ultimate budget way is to explore the weathered valley on foot, we recommend you to invest 3000 CLP (for six hours) into renting a bike (there are several rental companies in San Pedro de Atacama and all of them have a similar price). You can also rent a bike for the full day, but the 30 kilometers ride was doable in six hours plus we can't see ourselves to spend more time cycling under the harsh sun and without a possibility to hide in a shade. From San Pedro de Atacama, follow the paved road heading to Valle de la Luna. After six kilometers you must stop by the visitor's center, where you pay the entrance fee, and the staff will provide you with a map. Although the terrain is not somehow difficult (there are some ups and downs), the path is not in very good conditions which make cycling a bit harder and bumpier and the combination with the sun can be tiring. Do not forget to bring plenty of water and sunscreen. Along the way, there are several stops where you must dismount your bike (there are bicycle racks where you can lock the bike) and carry on on foot. Our travel tip | Many people (including organized tours) head to Valle de la Luna before sunset to enjoy the peaceful view of last sunrays of the day disappearing behind other-worldly rock formations. As you can suspect, those viewpoints get crowded, and also when biking, your ride back might not be that pleasant because of the large number of overtaking cars. Our suggestion is to start before mid-day to experience the tranquil atmosphere of the place. And what can you see while hiking or cycling Valle de la Luna? Apart from the fascinating sandy world and sandstone valleys, you can make several worthwhile stops. Caverna de Sal (Salt Cave) - this place is also better to explore before crowds arrive as some parts are very low and narrow. Duna Mayor - in our humble opinion, the most beautiful sight on the way. This large sand dune is a must-see when hiking, cycling or driving Valle de la Luna. Mirador Achaches - from this viewpoint you can admire the whole area, especially Cordillera de la Sal. Anfiteatro - after you pass the Mirador, there will be a huge rock on your right reminding an amphitheater. Surprisingly, there's no sign, but you will know straight away that this is it. The Salt Mines - an old, not functional mine is almost the last stop on the road, and not many people reach it. Should you have time, visit this place as it doesn't show only the mining structures, but also as it is uphill, you can overlook the photogenic winding road. Tres Marias - the last stop before you start heading back to San Pedro de Atacama are three tall rock formations which stand out from the abandoned flat field of sand. To save as much money as possible, you might need to stay in a dormitory in San Pedro de Atacama, but if you have some spare dollars, you will definitely find a suitable accommodation below. Budget: Tiny Hostel Atacama - very nice and clean place right in the center of the town. It is a hostel where you can socialize and find new friends while enjoying great service for the affordable price. Mid-range: Hostal Ayni - only a few hundred meters from the town center can be found a friendly oasis which won't ruin your bank account and still have an excellent level of service. Luxury: Hotel Pascual Andino - treat yourself in the middle of the desert in a hotel with excellent wifi, tasty breakfast, and welcoming pool. 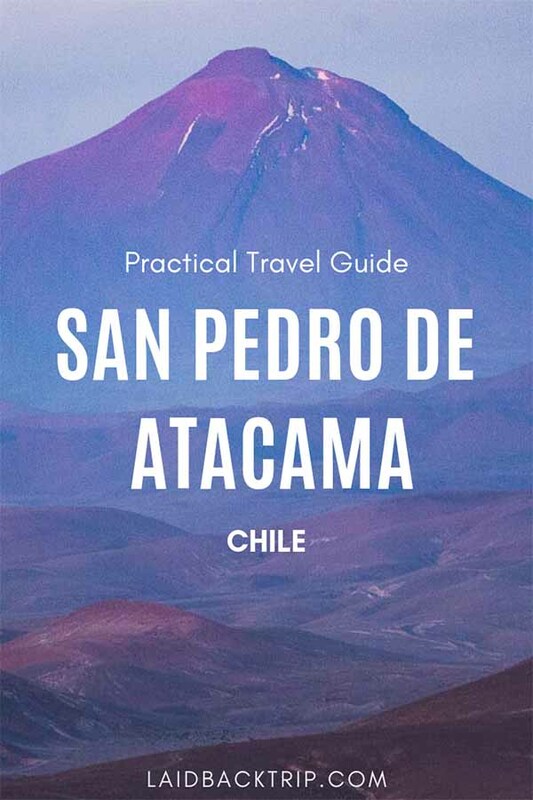 Although far on the Chilian north, thanks to its popularity, it is fairly easy to reach San Pedro de Atacama, even though it can be long when traveling by bus. Many travelers arrive in San Pedro de Atacama by minivan while crossing borders from Bolivia as this minivan is usually included in the Salar de Uyuni tour. San Pedro de Atacama is well-connected with Antofagasta (from where you can take a flight to farther destinations), Valparaiso, La Serena, or Santiago de Chile (you can take a direct bus with company Turbus which takes 22 hours). Roads in Chile are one of the best in South America, so traveling by bus is much more comfortable. World Nomads Travel Insurance has been designed by travelers for travelers, to cover your trip essentials. Don't forget to arrange your insurance before arriving in Chile!